These sessions address trainers who wish to customize the Academy of ICT Essentials for Government Leaders for training workshops for ICT policymakers and implementers in their own countries. The overall objective of the sessions is to enable trainers to design training workshops that are underpinned by effective and appropriate instructional design principles and strategies. Describe instructional design strategies and best practices for training workshops on the Academy modules. Design training sessions for ICT policymakers and implementers in your country that are underpinned by effective and appropriate instructional design principles and strategies. 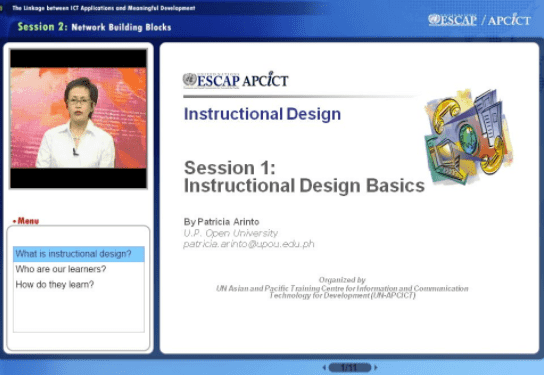 Patricia Arinto is an Associate Professor at the Faculty of Education of the University of the Philippines Open University (UPOU) where she teaches courses on foundations of distance education, learning theories and instructional design, and online teaching and learning. She has extensive experience in instructional design for distance education programs and instructional materials in various disciplines, having served as director of UPOU's Office of Academic Support and Instructional Services from 2000 to 2004. She has also designed and implemented teacher professional development programs in ICT integration across the curriculum in the Philippines, Cambodia, and Lao PDR. In addition, she has edited various publications in ICT for development, including the Academy of ICT Essentials for Government Leaders module series published by UN APCICT. She is co-editor (with Shahid Akhtar) of the Digital Review of Asia Pacific 2009-2010 published by ORBICOM and the International Development Research Center of Canada.